I absolutely love cooking for my friends and family, there’s nothing quite like sitting down to a tasty meal with plenty to drink and some of your favourite people around you. Cooking for others is such a satisfying and enjoyable thing to do, one that your friends too will appreciate (I hope) and may even offer to help wash up at the end! 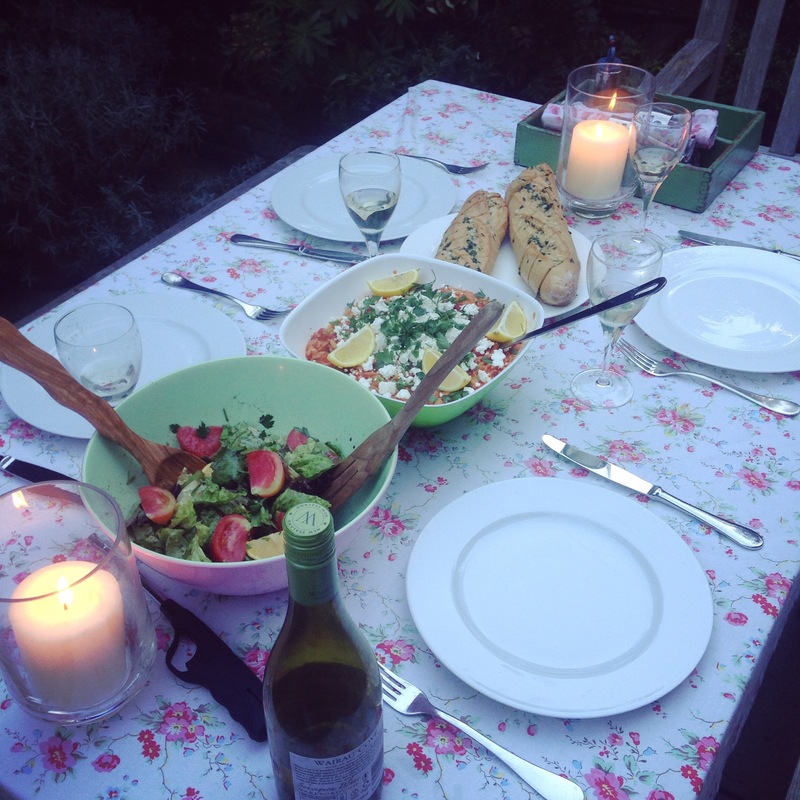 However, I realise that cooking for a large group of hungry people can be daunting, so I’ve put together some of my top tips for student dinner parties or just cooking a meal for smaller groups of friends or family. Plan ahead, this is a big one. Make sure you know your audience, double check with your friends that no one is secretly allergic to anything, who is following any specific free-from diet, and any religious dietary requirements. Decide on what you are going to cook a few days before, checking your cupboards for any forgotten ingredients that could use to spice up your chosen dish. Create a list and head to the shops with a budget in mind- it’s so easy to get carried away when you’re cooking for someone other than yourself! Keep it simple, I like to serve my food family-style, usually in the pots in which the food is cooked (less washing up) with serving spoons for everyone to help themselves. This style of serving lends itself to one-pot dishes that can be made ahead of the meal, such as chillies, curries, casseroles and risottos. Although none of these seem like spectacular culinary efforts, they are crowd pleasers and the ease of cooking them will mean that you will enjoy the company of your guests and will not be confined to the kitchen. I recommend a one pot dish with a few interesting sides where you can get a bit more creative. Split the cost, cooking for others can get expensive if there’s a large crowd. Ask your friends beforehand if they’d mind chipping in a little for ingredients, if you’re cooking for 6 and each person provides £3 then you’ve got almost £20 to create your feast, which is more than enough for a delicious meal. Alternatively, split the cost of booze, bread and dessert by asking your guests to provide these for you so all you have to worry about is buying the ingredients for the main course. Although dinner parties can be seen as an expensive luxury, a few cans of tomatoes and chickpeas with some supermarket basic pitta bread and yoghurt can create a tasty spread for very little cost that everyone can enjoy together. Rally the troops, if the idea of cooking an entire meal for a large group all by yourself is particularly daunting, then delegate! Round up your friends, family, or housemates to be your sous chefs. Having everyone in the same room can make the cooking a more relaxing experience and is a great excuse to get the drinks/party started early. Delegate jobs such as peeling, chopping and mixing that can be easily done with no pressure or kitchen bossiness from the head chef (that’s you!). Consider your environment, make sure you have enough plates, wine glasses, tumblers, jugs, serving dishes and boards for whomever and whatever you are cooking. If you haven’t got enough, ask your friends to bring theirs or, if you’re not feeling fancy, use mugs! Candles are always nice, and fairy lights too. Setting the table nicely will show off what you’ve cooked and give the meal a sense of being special. Cook what you love, whilst it’s important to keep in mind what your guests might want to eat for their dinner, as well as any special requests and requirements, but make sure that you cook what you enjoy cooking. If you hate waiting for sauces to simmer then make a fresh, zingy pasta dish, if you hate stirring things on the hob then create an entirely oven baked menu, it’s up to you! Have fun and enjoy yourself and your friends will too. Here are some of my recipes that would be perfect for cooking for a crowd- just increase the quantities!